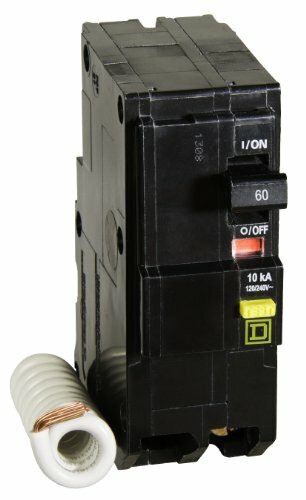 The Square D by Schneider Electric QO Qwik-Gard 60 Amp Two-Pole GFCI Circuit Breaker is intended for protection of entire branch circuits where damp-location shock hazards may exist, providing overload and short-circuit protection of your electrical system. The ANSI-certified and UL-listed unit is rated for 120/240 VAC and 10,000 AIR. All QO circuit breakers are equipped with the exclusive Visi-Trip indicator. When a QO Visi-Trip circuit breaker trips, the handle snaps to a midpoint position between "OFF" and "ON" and a highly visible, red indicator easily identifies the tripped breaker. This enables you to easily distinguish which breaker has tripped in a load center that may contain up to 42 different circuit breakers. QO circuit breakers have features no other manufacturer can offer. They come in many different sizes and can meet the needs of virtually every function in your home or business. These types of quality, industry exclusive products keep the Square D brand ahead of the competition and are builders' and electrical contractors' first choice in electrical protection. If you have any questions about this product by Square D by Schneider Electric, contact us by completing and submitting the form below. If you are looking for a specif part number, please include it with your message.